I love Lamb. But, lamb is expensive, so we rarely have a Sunday roast lamb. It’s like, special occasion dinner. So tender and tasty and I’m weirdly obsessed with mint sauce. It’s just wonderful. So, in an attempt to eat more lovely lamb, without crying about the cost, I’ve decided to be a bit more adventurous with our leftovers and had a go at an Easy Leftover Lamb Curry. Don’t get me wrong, we always use them. Even if we’ve had a £4 chicken, we save what’s left for another meal, and we freeze any leftovers from our midweek meals. I hate throwing food away and there’s usually no need. But, Sunday lunch leftovers are normally sandwiches or just a leftover lunch the next day if there’s also veg and potatoes left. Not particularly exciting or worth the expense of the meat. So, this week I made a Leftover Lamb Curry. It was amazing. The lamb is already cooked, so you just need to chop it into chunks. If there’s not much left, don’t worry. A little lamb goes a long way, and the diced lamb I order from Asda only comes in 350g packs anyway. If you’ve got less than this, add some spinach, potatoes or chickpeas to bulk it out a little bit. The sauce here is quite spicy, but not too bad. My kids liked it. If you want it milder, use less chilli powder and if you prefer a creamy curry add a splash of double cream. Curry is a brilliant way to use leftovers. Letting the meat simmer away in a curry sauce ensures it’s still soft and tender without any dryness that you can sometimes find in leftover meat. It also takes on the stronger flavours really well. 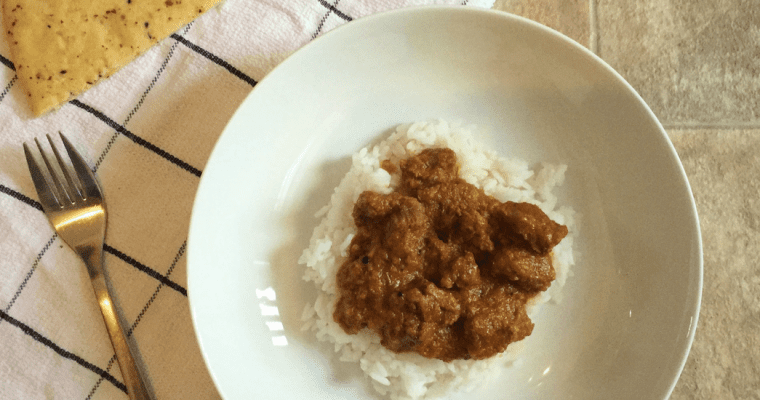 This Leftover Lamb Curry is quick and easy and super super tasty. I left mine to simmer away for a good 90 minutes. But, as the lamb is cooked already you can eat it as soon as it’s at the right consistency. I do recommend the long cooking time though, it brings the spices together and gives the sauce a good chance to reduce. It also allows the lamb to take on some of the flavours, so that it tastes like it was cooked in the sauce, not just leftover lamb dumped into another meal. We served our Leftover Lamb Curry with brown rice, but it would also be fantastic with my homemade garlic naan bread. An easy, tasty curry. Perfect for using up leftover lamb. Use as much lamb as you have leftover. Ideally around 500gs. Add potatoes, chickpeas or spinach if much less. Serve with rice or naan breads.